Hopefully around March I should start to play or do some match simulations, but we’ll know a bit more when I get closer to that time. At this stage my goal is to hopefully play round one, either in the VFL or AFL, so we’ll see how things go. 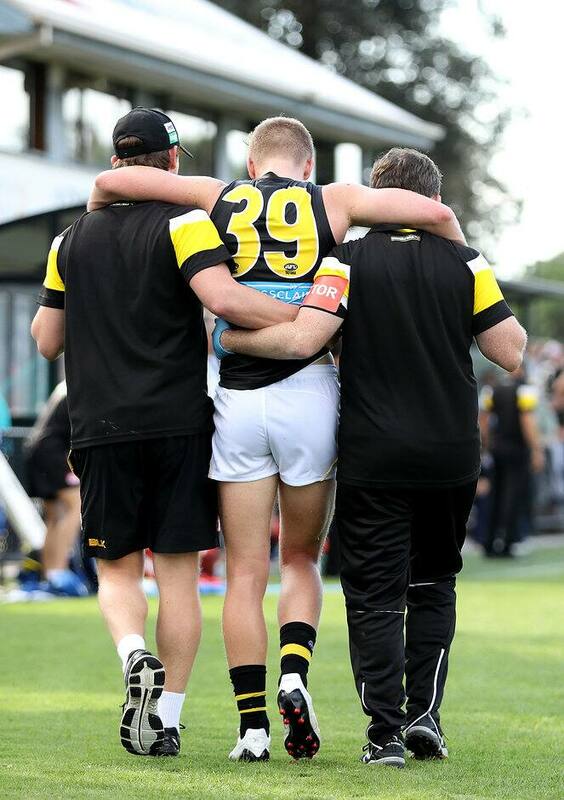 RICHMOND midfielder Nathan Drummond is closing in on the final stages of his rehabilitation from a second knee reconstruction and is shooting for an emotional return in round one. Drummond is seven-and-a-half months into his recovery after rupturing the anterior cruciate ligament in his left knee in the VFL in April, almost two years to the day after suffering the same injury in his right knee on debut. The 22-year-old, who signed a new deal for 2018 shortly before taking a three-week break at the end of the season, said he had found motivation in watching his teammates win the 2017 premiership and was aiming to be part of a successful 2018. "Things are going really well and it’s a lot better than the first one I did," Drummond told AFL.com.au this week. "Hopefully around March I should start to play or do some match simulations, but we’ll know a bit more when I get closer to that time. "At this stage my goal is to hopefully play round one, either in the VFL or AFL, so we’ll see how things go. "If I have to wait another three weeks I’d rather do that then potentially risk hurting it again." Drummond's commitment through his rehab has been noted at Punt Road Oval, and last Saturday he completed a 7km running session over 40 minutes in the pouring rain. He cut a lonely figure as Victoria braced for storms, but putting in the necessary hours on his own motivates the versatile youngster, who moved on to a six-minute running test – covering as much distance as he could in that time – this weekend. "I’ve had to do a lot of the things on my own so I’m used to training apart from the group," he said. "I think that sort of stuff motivates me a lot, doing it on my own, and if I have to do it on a Saturday on my own it's fine, I’m not too worried about that. "But it would be nice to be back full training and kicking the footy rather than running around doing, not pointless things, but things you don’t want to be doing." The straight line running Drummond is doing now will progress soon into agility patterns and then into random agility work. After Christmas he will move into contact drills and will ideally have two months of full training before playing, moving into the forward line group in 2018 where he will fight for a spot as a pressure forward. The mental challenges coming back from a second knee reconstruction were there initially, but Drummond said he had gained confidence in knowing he had completed a full rehabilitation before. "I overcame those fears in the first one so I’m ready to tackle playing again … it’s a positive out of doing both, if you can take one out of it," he said. "When I was doing new things like jumping or landing or changing direction, if I have time to think about it sometimes I’m a bit cautious. "But I’ve got over the small fears I had in the first one and it's set me up well and I'm not really worried about it with the second one." Both of Drummond's parents suffered ACL tears, with his Dad tearing both playing local footy and his Mum suffering the injury playing netball. Drummond's surgeon explained to him that having knees that are susceptible to the injury can be passed down genetically, but the reconstruction process makes the ligaments stronger. Now on the home stretch, and with two stable knees, Drummond hasn't had to look far for motivation as he prepares for a change of luck in his fourth season. "I try to wake up every day and remember what I’m trying to achieve," he said. "You try to find positive things and things that keep you motivated because nine to 12 months is a long time when it’s your full-time job. "But watching the boys win the flag and playing in the VFL Grand Final, success like that really motivates me and hopefully next year I can be a part of something like that. It motivates me a lot."